Anaphylactoid reactions induced by preparations containing red ginseng have been reported. The aim of this study is to evaluate the allergenicity and screen potential allergens in red ginseng extract thoroughly. Red ginseng extract (RGE) and different fractions of RGE were prepared and evaluated by measuring the degranulation and viability of rat basophilic leukemia 2H3 (RBL-2H3) cells. Potential allergens were screened by RBL-2H3 cell extraction and allergenicity verified in RBL-2H3 cells, mouse peritoneal mast cells, Laboratory of Allergic Disease 2 (LAD2) human mast cells and mice, respectively. 80% ethanol extract of red ginseng extract induced mast cell degranulation with less cytotoxicity, but 40% ethanol extract could not. Ginsenoside Rd and 20(S)-Rg3 could induce a significant increase in β-hexosaminidase release, histamine release and translocation of phosphatidylserine in RBL-2H3 cells. Ginsenoside Rd and 20(S)-Rg3 also increased β-hexosaminidase release and the intracellular Ca2+ concentration in mouse peritoneal mast cells and LAD2 cells. In addition, histamine levels in serum of mice were elevated dose-dependently. Ginsenoside Rd and 20(S)-Rg3 are potential allergens that induce the release of mediators associated with anaphylactoid reactions. Our study could guide optimization of methods associated with Rd/20(S)-Rg3-containing preparations and establishment of quality standards for safe application of Traditional Chinese Medicines. Ginseng (Panax ginseng C.A. Meyer) has been used as an elixir in Asia for thousands of years. Additionally, it is one of the most popular herbal medicines used as a functional food or therapeutic supplement in Western countries [1, 2]. Red ginseng is a very popular processed product of ginseng with different biologic activities and wide clinical applications. During the steaming or heating, less polar ginsenosides (20(S)-Rg3, Rh2, and Rs3, etc.) in red ginseng increased , which have been reported to exhibit greater potential than polar ginsenosides in terms of anti-inflammatory, anti-oxidative and anti-cancer effects [4, 5]. Therefore, an extract of red ginseng or its constituents are used more often in some TCM formulations than those of other processed products for the treatment of cardiovascular diseases or cancer [6, 7]. This is especially the case for Traditional Chinese Medicine Injections (TCMIs)  such as shengmai injection and shenmai injection. However, along with the wide use of red ginseng, adverse drug reactions occur frequently, especially anaphylactoid reactions (ARs). Several red ginseng-containing TCMIs  or ginsenoside-containing TCMIs  have been shown to cause ARs that may be related to components in red ginseng. Moreover, several cases of ARs induced by oral administration of ginseng or inhalation of ginseng dust have also been recently reported [11, 12]. Therefore, the allergenicity and potential allergens in red ginseng (especially its bioactive components) must be clarified to improve preparation methods and quality as well as to ensure safety of use. Due to the complexity of components in TCMs, the screening and analysis of specific bioactive components in TCMs are troublesome issues. Pharmacologic studies have shown that most drugs played a role firstly via combination with some receptors or channels on cell membranes. Therefore, cell membrane chromatography and cell membrane extraction have been applied in many studies and have some advantages over conventional methods (which are time-consuming and arduous) for preliminary investigation of the potential bioactive components of TCMs . In this report, the allergenicity of red ginseng extract (RGE) and different extract fractions were preliminarily evaluated in rat basophilic leukemia 2H3 (RBL-2H3) cells. Potential allergens in RGE were screened using RBL-2H3 cell extraction and the allergenicity of target components was verified further in mouse peritoneal mast cells, Laboratory of Allergic Disease 2 (LAD2) human mast cells in vitro and mice in vivo. Modified Eagle’s medium (MEM), StemPro-34 SFM Medium and trypsin were purchased from Gibco (Grand Island, NY, USA). Fetal bovine serum (FBS) was obtained from Sciencell (Carlsbad, CA, USA). Recombinant human stem cell factor was purchased from Peprotech (Rocky Hill, NJ, USA). Compound 48/80 (C48/80), l-glutamine, 3-(4,5-Dimethylthiazol-2-yl)-2,5-diphe-nylte-trazolium bromide (MTT), p-nitrophenyl-N-acetyl-β-d-glucosaminide and poly-d-lysine hydrobromide (PDL) were purchased from Sigma Aldrich (Saint Louis, MO, USA). Triton X-100 was obtained from Amresco (Solon, OH, USA). Penicillin and streptomycin were purchased from Beyotime Biotechnology (Shanghai, China). Ginsenoside Rd, Rg1, Rf, 20(S)-Rg3 and 20(R)-Rg3 were purchased from Must Bio-technology (Chengdu, China). Pluronic acid F-127 was obtained from Invitrogen (Carlsbad, CA, USA). A calcium 5 assay kit was obtained from molecular devices (Sunnyvale, CA, USA). ELISA kits for histamine were purchased from Biocalvin (Suzhou, China). An Annexin V-FITC fluos staining kit was purchased from KeyGEN BioTECH (Nanjing, China). RBL-2H3 MCs were purchased from the cell bank of the Chinese Academy of Sciences (Shanghai, China). Cells were cultured in MEM supplemented with 15% FBS, 100 U/ml penicillin, 100 μg/ml streptomycin and 0.11 g/l sodium pyruvate in a humidified atmosphere of 5% CO2 at 37 °C. Laboratory of Allergic Disease 2 (LAD2) human MCs were provided by Dr. Renshan Sun at the Third Military Medical University (Chongqing, China). Cells were cultured in StemPro-34 SFM medium supplemented with 2 mM l-glutamine, 100 U/ml penicillin, 100 μg/ml streptomycin and recombinant human stem cell factor (100 ng/ml). Cell suspensions were seeded at 1.0 × 105 cells/ml and maintained in a humidified atmosphere of 5% CO2 at 37 °C. Cell culture medium was hemi-depleted every week with fresh medium. ICR male mice (18–22 g) were obtained from Yangzhou University (Yangzhou, China). Animals were housed with a 12-h light–dark cycle at 22 °C and relative humidity of 55 ± 5%, and had free access to food and water. All experiments protocols involving animals were carried out according to guidelines set by Institutional Animal Care and Use Committee of China Pharmaceutical University (Jiangsu, China). MPMCs were isolated using a method adapted from Jensen et al. . Adult male mice were sacrificed. A total of 10 ml ice-cold phosphate-buffered saline (PBS) was used to make two sequential peritoneal lavages, which were combined and centrifuged at 800g for 10 min at 4 °C. The supernatant was decanted to leave a small MC pellet (≈2 ml), and 2 ml of 30% Percoll and 80% Percoll added successively to form an interface (final volume ratio: 1:1:1). After centrifugation at 600g for 15 min at 4 °C, cells at the junction interface were collected and washed with PBS twice (200g, 10 min, 4 °C). MCs were resuspended in DMEM with 10% FBS. Purity and viability were determined by toluidine blue staining and trypan blue exclusion. Red ginseng was soaked in 95% ethanol overnight, and then extracted thrice under reflux for 3, 3 and 2 h, respectively. The filtrate was evaporated under reduced pressure at 50 °C, and the residue was suspended in H2O and freeze-dried to obtain RGE. RGE was dissolved in water and absorbed by AB-8 macroporous resin for 1 h. After elution with water [five times the column volume (5 V)] and 25% ethanol (4 V), the resin was eluted with 40% ethanol (3 V). The eluate was collected, concentrated, and freeze-dried to obtain 40% ethanol extract (40% EE). After elution a further four times with 40% ethanol, the resin was eluted with 80% ethanol (5 V). Then the eluate was collected, concentrated and freeze-dried to obtain 80% ethanol extract (80% EE). RGE was dissolved in MEM without FBS and filtered through a membrane (pore size, 0.22 μm) to create the sample solution. After incubation of RBL-2H3 cells with the filtrate at 37 °C and 5% CO2 for 1 h, the supernatant was discarded. Deposited cells were washed six times with 3 ml of PBS each time. Eluates were discarded except the last one, which was collected and used as a control for HPLC–DAD-Q-TOF–MS/MS analyses. Then, deposited cells were denatured and extracted with 3 ml of 80% methanol. After centrifugation at 9000g for 10 min, the supernatant was collected and dried. The residue was dissolved in methanol again and filtered through a membrane (pore size, 0.45 μm) for HPLC–DAD-Q-TOF–MS/MS analyses . Cells incubated with MEM without FBS were prepared to the control sample using the same procedures as described above. HPLC–DAD-Q-TOF–MS/MS analyses were carried out using 1260 Infinity HPLC instrument (Agilent Technologies, Santa Clara, CA, USA) coupled with a 6520 Q-TOF mass spectrometer (Agilent Technologies) equipped with a dual electrospray ionization (ESI) source. The mobile phase consisted of water-0.01% formic acid (A) and acetonitrile-0.01% formic acid (B). Gradient elution conditions were: 0–30 min, 8–25% B; 30–80 min, 25–45% B; 80–100 min, 45–76% B and then returned to the initial condition. The flow rate was 1 ml/min. Chromatographic separation was carried out at 30 °C on a Venusil C18 column (250 mm × 4.6 mm, 5 μm). Samples were detected at 203 nm. Parameters of MS detection were optimized as follows: drying gas temperature, 325 °C; flow rate of drying gas (N2), 8.0 l/min; fragmentor voltage, 120 V; nebulizer, 40 psi; capillary, 3500 V; skimmer, 65 V; Oct RFV, 750 V. The sample collision energy was set at 35 V. All acquisition and analyses of data were controlled by Mass Hunter software (Agilent Technologies). Mass spectra were recorded in the range m/z 100–1700 with accurate mass measurement of all peaks. Each sample was analyzed in negative mode. In order to assess that β-hexosaminidase release was induced due to allergenicity of potential allergens rather than cytotoxicity. Cell viability was determined by the MTT assay. RBL-2H3 cells were seeded in a 96-well plate at 1 × 104 cells/well. After 24 h of incubation at 37 °C in an atmosphere of 5% CO2, cells were treated with different concentrations of test compounds for 30 min. Then, the supernatant was discarded and cells were incubated with MEM containing 0.5 mg/ml MTT at 37 °C and 5% CO2. After 3 h, the medium was removed and 150 μl dimethyl sulfoxide added to each well. Absorbance was measured at 570 and 650 nm. β-Hexosaminidase is an enzyme contained in the cytoplasmic granules of mast cells and the level of this enzyme released into the supernatant provides an indication of the degree of degranulation when mast cell is activated. β-Hexosaminidase release from mast cells was examined as described previously with some modifications . RBL-2H3 cells (1 × 104 cells/well) or MPMCs (3 × 104 cells/well) in a 96-well plate were cultured for 24 h, washed with MEM/DMEM without FBS, respectively, and stimulated with different concentrations of sample solutions or the positive control C48/80 (30 μg/ml) for 30 min at 37 °C in an atmosphere of 5% CO2. LAD2 cells were resuspended at 3 × 105 cells/ml in HEPES buffer (10 mM HEPES, 137 mM NaCl, 2.7 mM KCl, 0.38 mM Na2HPO4·7H2O, 5.6 mM glucose, 1.8 mM CaCl2·H2O, 1.3 mM MgSO4·7H2O, pH 7.4). Cell suspension (150 μl) was added to each well of 96 wells, and then stimulated with different concentrations of sample solutions or the positive control C48/80 (1.5 μg/ml) for 30 min at 37 °C in an atmosphere of 5% CO2 . RBL-2H3 cells (5 × 104 cells/well) in a 24-well plate were cultured for 24 h, and washed with MEM without FBS. Cells were incubated with different concentrations of sample solutions for 30 min at 37 °C in an atmosphere 5% CO2. Then, the supernatants were collected and centrifuged at 845g for 10 min. Histamine content in the supernatant was determined using ELISA histamine kits according to the manufacturer’s instructions. Mice were randomly divided into eight groups (n = 8), including vehicle control, C48/80 (2.5 mg/kg), Rd groups (10, 20 and 40 mg/kg) and 20(S)-Rg3 groups (5, 10 and 20 mg/kg). All test compounds were dissolved in saline containing 20% propylene glycol and continuously injected via the tail vein. Blood was collected at 10 min, and serum was obtained through centrifugation (825g, 10 min, room temperature). Histamine content in the supernatant was determined using ELISA histamine kits according to the manufacturer’s instructions. According to the instructions provided with the Annexin V-FITC detection kit, RBL-2H3 cells were treated with different sample solutions for 30 min and washed twice with cold PBS. Then binding buffer containing Annexin V-FITC (5 μl) was added. After 5 min in the dark, cells were examined and photographed at 630× magnification on an laser scanning confocal microscope (Zeiss LSM700, Jena, Germany). [Ca2+]i was measured using the fluorescence indicator calcium 5/AM. MPMCs or LAD2 cells were plated onto a 96-well plate coated with 50 μg/ml PDL and balanced at 37 °C in an atmosphere of 5% CO2. After 6 h, cells were loaded with calcium-5 with 0.02% Pluronic F-127 for 45 min at 37 °C in an atmosphere of 5% CO2, and washed five times with K25-Locke’s buffer (4 mM NaHCO3, 10 mM HEPES, 5 mM glucose, 2.3 mM CaCl2, 1 mM MgCl2 and 134 mM NaCl/25 mM KCl, pH 7.4 at 37 °C) , to leave a final volume of 150 μl in each well. Then, the plate was transferred to the plate chamber of FLIPR (Molecular Devices, Sunnyvale, CA, USA). Cells were excited at 470–495 nm, and emission detected at 515–575 nm. Fluorescence readings were taken every 1 for 120 s to establish the baseline. Then, 50 μl of different concentrations of sample solutions (4×) were added to different wells from the compound plate at 26 μl/s, yielding a final volume of 200 μl/well. Fluorescence readings were taken for 20 min. All analyses were undertaken using GraphPad Prism v5.01 (GraphPad Software, La Jolla, CA, USA). Data are the mean ± SEM. One-way analysis of variance followed by Dunnett’s test was used for multiple comparisons. p < 0.05 was considered significant. Each experiment was repeated at least thrice. Degranulation was monitored by β-hexosaminidase release. RGE (Fig. 1a) could induce β-hexosaminidase release in RBL-2H3 cells directly at >1.2 mg/ml. 80% EE (Fig. 1b) could induce significant release (p < 0.05) of β-hexosaminidase at 0.2 mg/ml in a concentration-dependent manner, whereas 40% EE (Fig. 1c) could not. Change in β-hexosaminidase release by combination of different ratios of 80% EE and 40% EE (Fig. 1d) was dependent upon the proportion of 80% EE. These findings suggested that RGE might possess allergenicity and that allergens might be present in 80% EE. To investigate if β-hexosaminidase release was associated with cytotoxicity, cell viability was determined by the MTT assay simultaneously. After incubation with different concentrations of RGE (Fig. 1e), 80% EE (Fig. 1f) and 40% EE (Fig. 1g), there was virtually no effect on cell viability, suggesting that cell degranulation was induced by allergenicity rather than cytotoxicity. RBL-2H3 cell extraction was used to screen the components binding to RBL-2H3 cells. Twenty major ginsenosides were identified from RGE (Fig. 2a), nine of which [Rg1, Rb1, Re, Rf, Rg2, Rd, 20(S)-Rg3, 20(R)-Rg3, Ro] were confirmed by comparing the mass spectra and retention times with those of reference compounds, whereas the others were tentatively those of known ginsenosides. Details of identified ginsenosides are summarized in Table 1. RBL-2H3-binding components were screened and identified by extracted ion chromatograms (EIC) mode. Five components (peaks 3, 5, 13, 17, 18) were screened (Fig. 2b) by EIC mode and comparing the mass spectra with reference substances (Fig. 2c): ginsenoside Rg1, Rf, 20(S)-Rg3, 20(R)-Rg3 and Rd. No components were detected in control sample (Fig. 2d) and final-wash eluate (Fig. 2e). 20(S)-Rg3 and 20(R)-Rg3 (Fig. 3a) were extracted simultaneously at m/z 783.4748 ([M−H]−). Rg1 and Rf (Fig. 3b) were extracted simultaneously at m/z 845.4896 ([M+HCOO]−). Rd (Fig. 3c) was extracted at m/z 945.5400, 783.4878, 621.0000 and 161.0424 based on m/z 991.5428, respectively. Due to the possibility of non-selective binding, the effect of screening of each component mentioned above on β-hexosaminidase release from RBL-2H3 cells was determined to verify allergenicity preliminarily. Rd (Fig. 4a) and 20(S)-Rg3 (Fig. 4b) could induce direct degranulation of MCs in a concentration-dependent manner, whereas 20(R)-Rg3 (Fig. 4c), Rg1 (Fig. 4d), and Rf (Fig. 4e) had no significant effect on MCs (p > 0.05). These results suggested that ginsenoside 20(S)-Rg3 and Rd might possess allergenicity to some extent. Histamine is also a classic mediator released concomitantly with β-hexosaminidase if MCs are activated. Histamine release in supernatants of RBL-2H3 cells was determined using an ELISA kit. Ginsenoside Rd (Fig. 5a) and 20(S)-Rg3 (Fig. 5b) could also induce significant release of histamine, which was consistent with that seen with β-hexosaminidase. 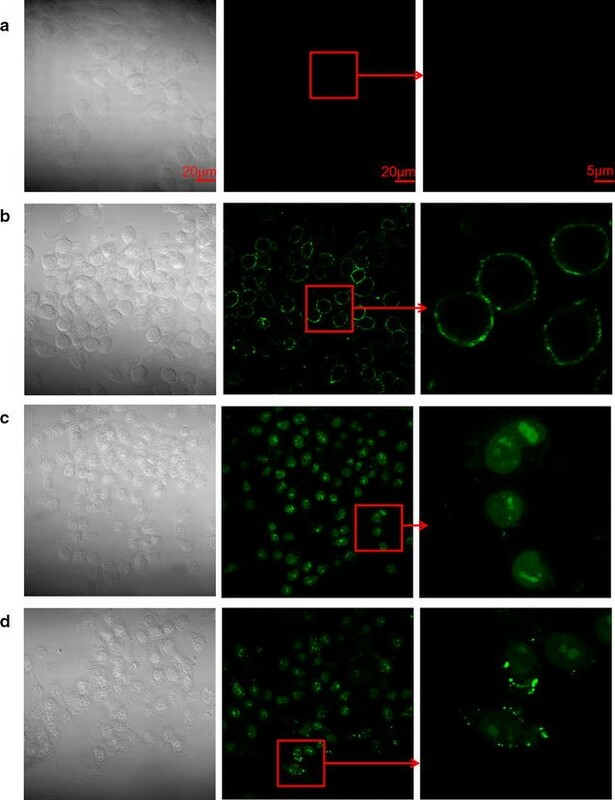 It has been reported that the membrane phospholipid phosphatidylserine translocates from the inner to outer leaflets of cytomembranes during MC degranulation [18, 19]. Annexin V-FITC can bind to cells with exposed phosphatidylserine, causing the cells to appear green. Compared with the vehicle group (Fig. 6a) and C48/80 group (Fig. 6b), ginsenoside Rd (Fig. 6c) and 20(S)-Rg3 (Fig. 6d) could induce phosphatedylserine translocation in RBL-2H3 cells. To verify further the reliability of the results obtained in RBL-2H3 cells, the same indicators in MPMCs and LAD2 cells were determined. Release of β-hexosaminidase induced by Rd and 20(S)-Rg3 in MPMCs (Fig. 7a, b) and LAD2 cells (Fig. 7c, d) was consistent with that observed in RBL-2H3 cells. Increase in cytosolic calcium is essential both for degranulation and the release of de novo synthesized mediators in mast cells . Change in [Ca2+]i is an indication of the degree of mast cell degranulation. So we investigated if Rd and 20(S)-Rg3 could induce Ca2+ mobilization in MPMCs and LAD2 cells. C48/80 (Fig. 8a, b), ginsenoside Rd (Fig. 8c, d) and 20(S)-Rg3 (Fig. 8e, f) could induce responses in MPMCs and LAD2 cells. The degree of response was dependent upon concentration, which suggested that the mechanism of MC activation induced by ginsenoside Rd and 20(S)-Rg3 might be related to an increase in [Ca2+]i. Our results indicated that just after 10 min of intravenous injection, the histamine levels in serum of the Rd groups (Fig. 9a) and 20(S)-Rg3 groups (Fig. 9b) were elevated dose-dependently compared with that of the vehicle control group, and similar effect was observed in the positive control C48/80 group. These results showed that Rd and 20(S)-Rg3 exhibited potential anphylactoid activity in vivo. Recently, reports about ARs induced by red ginseng have been increasing, but opinions on the source of allergens have been ambiguous. Solubilizers, such as Tween-80, have been reported to induce ARs in vitro or in vivo . It has also been reported that red ginseng itself might induce MC degranulation . However, a systematic study on the allergenicity and allergens related to ginsenosides in red ginseng is lacking. In the current study, we found that RGE could induce β-hexosaminidase release from RBL-2H3 cells, and that allergens were present mainly in 80% EE. Five components were screened by RBL-2H3 cell extraction and identified by EIC mode: ginsenoside Rd, 20(S)-Rg3, 20(R)-Rg3, Rg1 and Rf. We demonstrated that Rd and 20(S)-Rg3 were potential pseudo-allergenic ingredients in red ginseng by further verification in MPMCs, LAD2 cells (the only human analogue ) and mice. This is the first systematic evaluation on allergenicity and screening of potential pseudo-allergic ingredients of RGE, and ginsenoside 20(S)-Rg3 is reported to induce MC activation for the first time in our study. 20(S)-Rg3 is one of characteristic components in red ginseng, so the results further demonstrate that red ginseng is more likely to induce ARs than other processed products. The results about Rd allergenicity are consistent with the study by Lu et al. . They demonstrated that Rd was the direct inductor of RBL-2H3 degranulation. Therefore, our study also confirms the reliability of RBL-2H3 cell extraction as a method of preliminarily screening potential allergens. ARs, which usually occur upon application of drugs or functional foods, are a serious public-health concern . They are not dependent on specific IgE and do not necessarily require previous exposure to an inciting substance. However, they are always dose- and concentration-dependent. Allergens can stimulate MCs or basophils directly to release biologically active substances via physical or chemical mechanisms that are not based on the immune system, though the true mechanism of action still remains unclear. β-Hexosaminidase is a potent inflammatory mediator stored in MCs and basophils and is often released in parallel with histamine from activated MCs and basophils. β-Hexosaminidase release is slow and the process persists for a longer time than that observed for histamine, so it is often used as a substitute for direct quantification of histamine during cell degranulation processes . The membrane phospholipid phosphatidylserine translocates from the inner to outer leaflets of the cytomembranes if mast cell degranulation occurs . Also, elevation of [Ca2+]i occurs during degranulation, which is also involved in activation of tumor necrosis factor α, IL-1β and IL-6 [17, 26]. In studies on the safety of TCMs or various preparations, most studies have focused on the properties of pharmaceutical adjuvants or food additives, whereas that the safety of the bioactive components themselves has attracted increasing attention in recent years. Several bioactive components have been reported to possess potential safety risks, such as bacalin , chlorogenic acid, cryptochlorogenic acid  and neoandrographolide , have also been reported to cause ARs by inducing MC degranulation directly in vitro or in vivo. Therefore, safety evaluation and improvement of quality requires more attention. Additionally, more effective methods should be established to screen target components in the complex system of TCMs quickly. Ginsenoside Rd and 20(S)-Rg3 are bioactive components and reported to possess anti-inflammation [30, 31] and anti-cancer activities , respectively. However, Rg3 has been reported to induce irreversible impairment of agonist-induced vascular contraction through blockade of Ca2+ mobilization via the L-type Ca2+ channel . Rd may induce ARs by disturbing lipid metabolism . [Ca2+]i in MCs and basophils increases through signaling after activation, and then results in degranulation . We found that Rd and 20(S)-Rg3 could induce an increase in [Ca2+]i as could C48/80 (a classical MC activator and a canonical basic secretagogue). However, the mode of change in [Ca2+]i seemed to be different, which suggested that upstream mechanisms of MC cell activation might be not identical. Rd and 20(S)-Rg3 are protopanaxodiol ginsenosides, and 20(S)-Rg3 can be transformed from Rd by a deglucosylation pathway in vivo . Our results indicated that ginsenosides involved in the metabolic pathway of Rd might elicit ARs or show allergenicity to different extent. Five components were screened in RBL-2H3 cell extraction, but only Rd and 20(S)-Rg3 could activate MCs and induce the significant release of β-hexosaminidase in a concentration-dependent manner. This phenomenon could result from non-selective absorption of cells. Conversely, RBL-2H3 cells can be used as a cell model of allergic reactions or anti-allergic reactions , anti-allergic bioactive components may have been absorbed by cells. Components were absorbed in RBL-2H3 cells but showed no potential for ARs were different to Rd and 20(S)-Rg3 in structure, so their anti-allergic bioactivities could be studied further. In conclusion, we supply a method, RBL-2H3 cell extraction, to screen potential allergens in complex components, and ginsenoside Rd and 20(S)-Rg3 are identified as potential allergens in red ginseng extract that may induce anaphylactoid reaction. Our study could guide optimization of methods associated with Rd/20(S)-Rg3-containing preparations and establishment of quality standards for safe application of TCMs. Conceived and designed the study: BYY, JQ, LW; performed the biological experiments: LW, YZZ, YY, XHZ; statistical analysis: LW; wrote the paper: LW; revised the paper: HYJ, JQ, BYY. All authors read and approved the final manuscript. We are grateful to Professor Zhengyu Cao for technical assistance. All procedures and assessments were approved by Animal Ethics Committee of the School of Chinese Material Medica, China Pharmaceutical University. All efforts were made to minimize unnecessary suffering and distress. This work was supported by grants from National Natural Scientific Foundation of China (81473317), the Science and Technology Development Fund of Macao SAR (013/2015/A1), Qing Lan Project, 2011’ Program for Excellent Scientific and Technological Innovation Team of Jiangsu Higher Education and the Priority Academic Program Development of Jiangsu Higher Education Institutions.